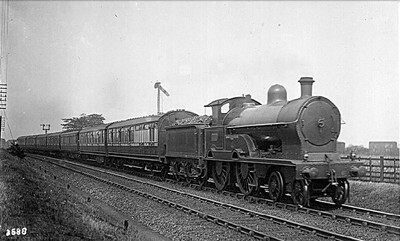 ‘George the Fifth’ 2242 Meteor but we know no details of the location and train. The number in the corner of the print is 3688. Can you help us out? I’m sure the location of this train is the up line just south of Golborne Junction.The two arm signal in the background is for trains from Lowton Junction leading to the slow/fast lines on the four track section from the junction to Wigan. I agree Golborne, one of several shots at this point by Gordon Tidey, probably spring 1914. They were on sale that summer. I have now located the photo, Tidey number 247. He says Up Scotsman, but is not always reliable. It could be the 10.00 Edinburgh-Euston/Bristol/Birmingham. The regular 1913 formation was BTK/TK/RC/BFK (Euston)/BCK (Bristol)/BCK (Birmingham). Liverpool and Manchester BCKs would have been detached at Preston. There is one vehicle too many - at first sight, the fourth from the front. It can't be the Glasgow portion (with which the Edinburgh-Euston carriages were combined at Crewe) because the Glasgow-Bristol and Glasgow-Birmingham BCKs came at the front of that train and so the diner would have been third from the rear and not third from the front. A possible alternative is the 12.00 Glasgow/Edinburgh-Euston which had just the one diner (from Glasgow) and picked up BCKs from Keswick and Windermere at Penrith and Preston.